Last week Mother Nature gave us a sneak peak into summer, and we had a few days of glorious sunshine and warm temperatures. I even broke out my flip flops. In February! But, it was just a tease, and that’s okay. The chillier temperatures (and who am I kidding, they’re still mild relative to the rest of the country in the depths of winter) made me crave comfort food once again. And what’s more reminiscent of childhood comfort foods than chicken soup? 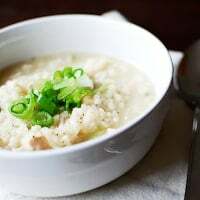 I vividly remember eating some of the best Arroz Caldo as a child while on a vacation to the Philippines, from a legendary outdoor food vendor in Laguna, where my maternal grandmother grew up. There were two tall, steamy vats full of the soup (as tall as I was at the time), and you could sprinkle your soup with toppings such as crispy cubes of fried tofu, dressed with soy sauce and vinegar, scallions, and garlic. I loved how the tangy combination of the soy sauce and vinegar would cut into the simple but very satisfying soup. Arroz Caldo was the soup my mom would make whenever we were sick, and the combination of onions, garlic and ginger at its base would always ease any tummy troubles. When I have a lot of time, I like to let the soup cook for hours, developing its own chicken-y broth. But when I’m in a rush, there are many shortcuts I can take so I can have this ready in under an hour. It tastes just as good, and sometimes, it’s nice to not have to wait. 1-2 tablespoons patis (fish sauce), to taste. If you don't have this handy, just use salt! In a large stock pot, saute the onion, garlic and ginger over medium heat until onion starts to become transparent. Add chicken, patis and pepper. When the chicken is cooked, add stock and rice. Bring to a boil, then lower heat to simmer. Cover and continue to cook until chicken is very tender. Stir frequently and adjust seasoning as necessary. Take out the medallions of ginger (no one really likes biting into chunks of ginger!). Garnish with scallions and freshly ground black pepper before serving. If you have extra time on your hands, after you saute the onion, garlic and ginger, go ahead and put half a chicken, bone in, into the soup pot, and season accordingly. Add water (or a combination of stock and water), and bring it to a boil. Allow the soup to simmer until the meat is falling off the bones and can be easily shred. Remove any bones. Add the rice and continue cooking until ready. Adjust the seasoning as necessary. I certainly agree that this is comfort food. It is light, yet very satisfying especially on a cold day. Oh—dreaming of warmer weather! We are still holding on to winter here. This rice dish sounds delicious! Wow, this recipe sounds scrumptious! I just made chicken soup the other day. It certainly is comfort food–my family loves it! Can’t wait to try your version! 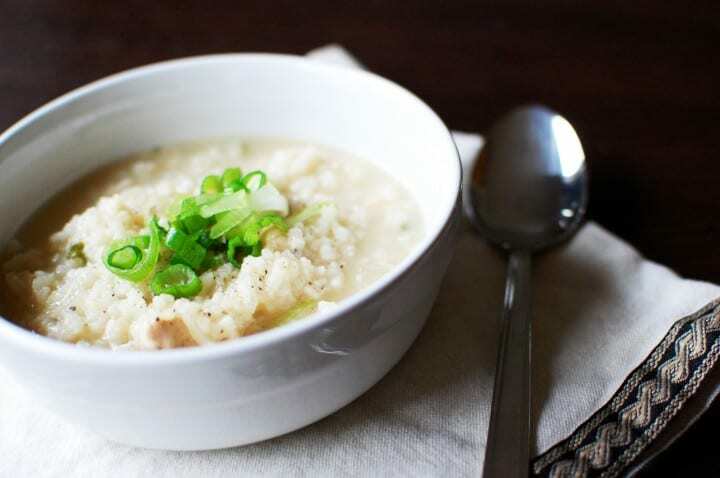 Arroz caldo was one of my favorites growing up too! Should the rice be cooked or uncooked before you put it in the pot? Use College Inn to make some of your favorites recipes taste even better – check them out at http://www.collegeinn.com/recipes.aspx. Lovely post =) There’s a place in the Philippines called Lucban (Quezon) where they serve arroz caldo with “lechon” (roasted pig) on top. Thank you! I’ve heard of Lucban! I’ve never had lechon on top but I love, love, love it with tokwa’t baboy. Arroz Caldo is also one of my comfort food, it always brings back childhood memories. Now I make it for my kids & they love it, too! I’m so glad my hubby and kids love it as much as I do, because it’s probably one of the few comfort foods we can all agree on, especially on rainy days!!! Isn’t it nice to pass these comforts on? Hi Liza, so glad you stopped by! YES, it’s all about the ginger and patis! I couldn’t agree more. I love arroz caldo, I started making it for my husband who’s Filipino and I love it more than he does. Ginger is my favorite spice and the more I add the better it tastes. I love squeezing the limes and patis in the end, can’t wait for the cold weather to get here so I can make it again. Thank you for stopping by and for your comment. How wonderful that you have learned how to make arroz caldo for your husband! My husband is not Filipino and he has learned to love arroz caldo as well. It’s such a universally satisfying soup! I love Arroz Caldo…….good for the cold winter time. I love to put calamansi or lemon. The best thing to go with the Arroz caldo is Tokwa’t Baboy (Tofu and Pork belly) SOOOOOOOOOO GOOOOOOOOOD!!! !